Lax Speedwell is a perennial herb, 50-80 cm tall, covered with white multicellular hairs. Stems are erect or ascending, simple. Leaves are stalkless or short-stalked. Leaves are ovate to ovate-triangular, 2-5 X 1-3 cm, margin coarsely toothed and mostly double toothed. Flower racemes are 1 or 2, arising from th axils of middle and upper leaves, lax, up to 20 cm in fruit. Bracts are broadly linear to inverted-lanceshaped, about 5 mm. Flower stalks are much shorter than bract. Sepal cup is 4-lobed - sepals linear-elliptic, 4 mm, 5-6 mm in fruit. Flowers are purple to blue, flat, 6-10 mm in diameter. Flower tube is less than 1.5 mm, throat hairy, petals round to rhomboid-ovate. Stamens are almost as long as flowers. Capsule is inverted-heartshaped, strongly compressed, 4-6 X 5-6 mm, ciliate with multicellular hairs, base wedge-shaped to rounded. 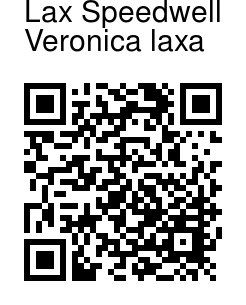 Style is 3-4 mm. 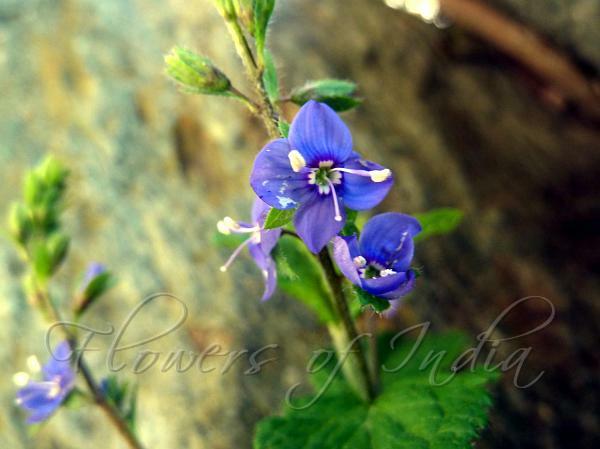 Lax Speedwell is found in Himachal Pradesh, Jammu & Kashmir, Sikkim, Uttarakhand, Nepal and Pakistan, at altitudes of 1500-2500 m. Flowering: June.